In the news report video below they discuss the 16 earthquakes that have hit the state of Texas over the last three weeks, but as of this morning with another 3.1-magnitude quake, that number is now 17. This last quake makes six in a one week period of time. While many suspect fracking for the quakes, state officials find no correlation between the Parker County town of Azle quakes and the injection wells, according to an update at Dallas News. But the Azle quakes all appear to be in close proximity to injection wells, according to a map created by National Public Radio’s State Impact project. 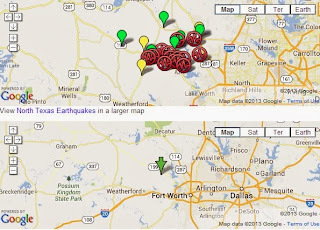 The map (below) shows where the quakes struck (red markers) in relation to those wells (the green markers). The map below that shows where Friday’s quake hit.